Although it is always appropriate to show appreciation, affirmation and to pray our spiritual leaders throughout the year, October is designated as Clergy Appreciation Month. 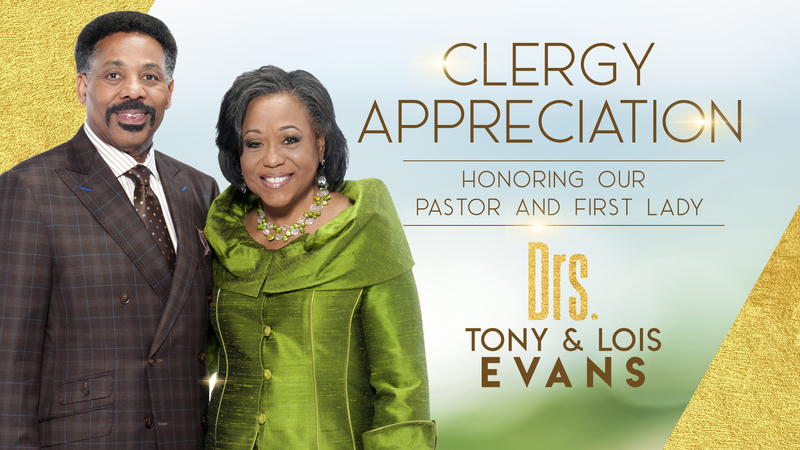 During the month, we encourage you to tangibly express your love and appreciation for our Pastor and First Lady, Drs. Tony & Lois Evans. Over the years, our members have experienced sound teaching, godly leadership, wise counseling, spiritual growth and a host of other benefits under Pastor and Mrs. Evans. Now it is time to appreciate them in very special ways. For your convenience, you can drop your gift in one of the offering boxes, at the church receptionist desk, or you can give it to them personally. Thank you for showing your appreciation for Pastor and Mrs. Evans.